Yep! We do have two releases today! I hope you all will take the time to read both “Yukarism” and “The Ghost Apartment Manager”. “The Ghost Apartment Manager” isn’t typical shoujo, but I hope if you’ve never read the series you will give it try, because it is a series with lots of heart and humor. Here’s a link to the first chapter. Chapter 4 involves dealing with the death of a pet. It may cause a few of you to sniffle. Personally, I always get a little misty whenever I see guys of any age cry. Anyhow, like the previous chapters of GAM, Sekka is a downer while the ghosts around him are rambunctious and funny. I’m very worried about Sekka. It seems that he’s slipping back toward his shut-in tendencies. It’s also clear to me that Sekka is a character who is suffering from depression. I wonder whether his thinking about tomorrow not coming is a little suicidal? Hopefully, the ghosts will pull him out of that funk, though, I imagine people who are actually diagnosed depressed would tell me that it’s not that simple. Kago and his dogs are funny! This dogs seems really likeable and friendly. I normally don’t like dogs, but when they are happy like this, I can tolerate them. Sekka’s situation — he seems pretty much resigned that his own life isn’t worth him living, but at least for now he’s thinking about helping somebody else instead of being a 100% self-absorbed depressive navel gazer. I hope now that he’s agree to being possessed that some part of his consciousness remains present so he can experience “life”. Looking Ahead: I’ve peeked ahead to the next few chapters and, of course, Kiyariko’s regret has to do with unresolved feelings for a teacher. Boo!!! This is, of course, complicated because Sekka and teacher are male (let the hilarity and misunderstandings ensue…). It looks as though the story line is handled with care, so although I hate this kind of plot line, I’m willing to give Fujieda-sensei the chance to play it through. Speaking of Fujieda Toru, I’m reading her other series “Dragon Girl”. It’s about a girl, Rinna, who wants to follow in her father’s footsteps by joining a cheering squad at a specific school. The first volume isn’t all that spectacular, but once the drama gets started, it’s quite compelling. It’s available from Yen Press in two omnibus collections. Here are links to get more information about the books and to make a purchases. Both omnibus collections are currently on sale through Amazon. Next up is the one-shot “3 Hearts” followed by our Halloween in May surprise one-shot “Twelve O’clock Bell Rings”. After that is the long awaited resumption of “Junketsu + Kareshi”. Thanks for the release! Did you post the link to the Yukarism chapter, because I don't see it for some reason. Maybe it's my computer. Wait, never mind. Didn't scroll down, silly me. Hrm.. maybe death being all around him is finally catching up to him. Lol, the 1st scene with Kago walking his does made me think of animes where they do the slow motion as the characters are running and laughing. What the..? Oh, right, right. In order to posses him, he must be super shocked first..lol. Oh, dear.. he even has HER hair style. ::shakes head:: The poor boy..lol. Thanks so much for doing this! I'm really enjoying this story. Like you, I'm worried about him. 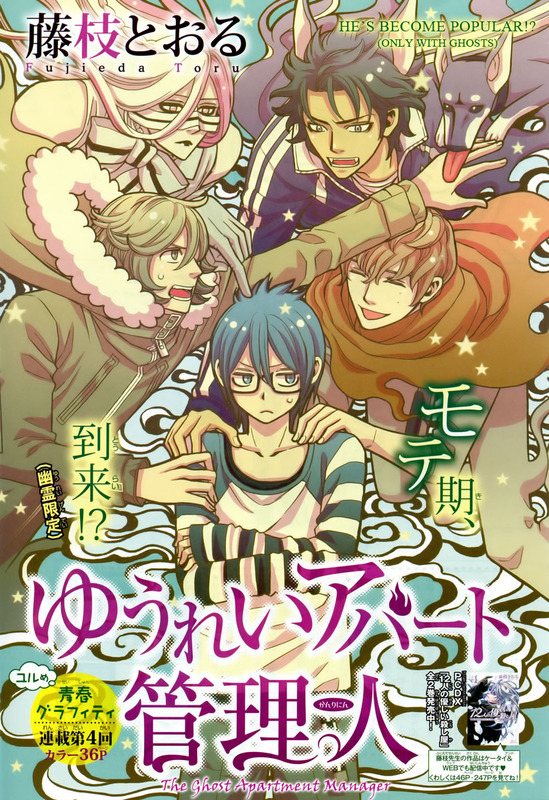 just want to say thank you and that this manga is very amusing to read..i liked the mystery and humour in it.